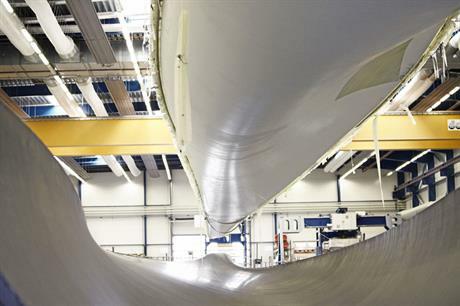 DENMARK: Blade extension packages, new hybrid materials and wireless sensor technology are all being deployed by leading blade manufacturer LM Wind Power in the drive to improve turbine efficiency and cut wind power costs. Turbine blades will play a growing role in the drive to reduce the cost of wind-generated electricity. They are expensive components, representing up to one-fifth of the manufacturing costs of an onshore turbine (one-tenth for an offshore machine) and that proportion is unlikely to reduce significantly in the near future, even with technology advances, says Roel Schuring, vice-president for engineering at Danish blade manufacturer LM Wind Power. But the new technology will make individual turbines work more efficiently, and cut wind energy costs generally. "The increasingly advanced blades have more benefits than 'just' creating more energy," says Schuring. "They also help to optimise loads on the turbine, which is the way to reduce the cost of other components. So the total cost of the turbine goes down, but the blades' share more likely will not," he says. In March, LM Wind Power unveiled a new concept for standard basic blades on which the rotor diameter can be extended with variable tip lengths. "Energy output of a wind turbine depends on its location in the wind farm as each is subjected to different wind conditions, often due to wake effects. Many wind turbines running today are not loaded to their full capacity as typically the turbines installed are of similar design regardless of the position in the array. This project seeks to change that," the company report explained. A standard blade is composed of two shells and two or three shear webs glued together. The idea of adding variable blade tip sections gives LM extra flexibility in the manufacturing process by moving to a modular product, says Schuring. "The range of the exchangeable section will be from one-sixth to one-quarter of the blade length," he explains. The concept is expected to cut the cost of energy for offshore applications by 8%, achieved through a combination of reduced product cost plus increased energy production from the optimised rotor and the overall performance of the wind farm. "In the long term, we expect wind farms to feature turbines with blades of different lengths," says Schuring. "Our flexible moulding concept is focused on ways to do this without an excessive cost increase of blades." Extension ranges for a particular turbine design will depend on the customers and their platform design. "The range can always be optimised according to the customer's request - if the customer wants to have an exchangeable one-tenth part of the blade, it will be achievable," Schuring says. Even the LM 73.5-metre blade, developed for Alstom's Haliade 150-6MW offshore turbine, can be extended with this concept, though not by as much as 25%, he adds. The blade extension development is a four-year research project, which began in April, and involves a consortium including the Dutch University of Twente and the Energy Research Centre of the Netherlands (ECN), supported by the Dutch economic affairs ministry. The use of new materials can also contribute to cost reduction, and LM has developed a hybrid material combining the properties of carbon and glass fibre that allows the blade length to be extended without increasing weight. A carbon-epoxy blade is approximately 25% more expensive than a glass-fibre polyester blade. "But the hybrid material we have developed combines the best of both worlds, striking the right balance between getting the benefits from the lighter and stiffer, albeit much more expensive carbon, while maintaining the existing manufacturing process and thereby keeping cost down," says Schuring. "The hybrid material gives us another lever to increase annual energy production while using standard technology. We expect to start prototype production of a blade with this carbon hybrid material by the end of the year." So-called intelligent blades are also expected to contribute to cost improvements. In May 2013, LM Wind Power announced a project to develop these, using wireless sensor technology after concluding that previously tested Lidar (light detection and ranging systems) were too expensive. Looking at the experience of its use in other industries, the wireless location-tracking technology has been emerging at a scale that would drive down costs at a significant pace. In essence, sensors in the blades will measure the geometry of the blade, and the results will be combined with traditional turbine-control data such as rotation speed, position and pitch angles, to produce detailed data on the wind speed in the rotor plane and the loads placed on the blades. This will give much more accurate measurements of wind conditions affecting the entire turbine compared with the single-point measurements currently coming from the anemometer on the nacelle. Developers can then install more powerful turbines with increasingly longer blades without incurring the excessive additional cost it requires for strengthening the turbine structure. LM claims that this technology could be a game changer in the industry. "In a project to test the feasibility of the technology, LM Wind Power has already demonstrated that wind-speed measurements derived from the radio-based sensor over the rotor disk at the single-blade level align well with measurements from the nacelle-mounted anemometer. This indicates that it is clearly more advanced and providing more opportunities," the company says. Together with the University of Aalborg in Denmark and Danish firms PolyTech and KK Wind Solutions, LM Wind Power is now working on the second generation of this sensor technology and its applications. The results so far "have increased our confidence that it is realistic to develop a new type of blade sensor technology that can deliver measurements of blade geometry changes on wind turbines while they are in operation", says Schuring. The blade sensors will then allow finer tuning in controlling individual blade pitch into and out of the wind in response to changes in wind flow. Funding for radio-based location tracking research from the Danish Innovation Fund runs until mid-2018, but LM Wind Power expects commercial availability of the technology before the end of this period, Schuring predicts.